Delicious on its own or as a rich base for healthy soups and sauces, this low carb bone broth is a staple in my kitchen. 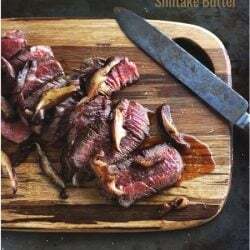 Making it in the Instant Pot is easy and much faster than the traditional way, though this keto bone broth recipe can easily be adapted to a slow cooker or a simmering pot on the stove – it will just take a lot longer. One of the reasons I love using the Instant Pot to make keto bone broth, is because the pressure cooking really breaks down the minerals in the bones and connective tissue. I have simmered pots of bone broth for days and still not gotten the softened bones that I can achieve with just an hour in my Instant Pot. No muss. No fuss. When I drain my bone broth, I press the bones and veggies into the strainer and they break down into a pile of mush. That’s how I know I’ve extracted everything I can get out of them. In addition, my keto bone broth never fails to solidify in the fridge, letting me know that all of that healthy collagen and gelatin from the bones and tissues has infused into it. It’s rich, hearty, delicious, and most of all loaded with essential vitamins and minerals for nourishing my family. If you don’t yet have an Instant Pot, I can’t recommend purchasing one highly enough. They cost around a hundred dollars (give or take depending on the time of year) and are worth every penny. 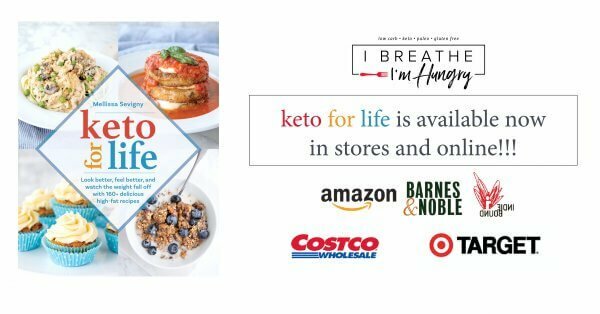 You can find them at Walmart and Target, or order your Instant Pot from Amazon like I did. You can read more about why I love my Instant Pot and some of its features on the IBIH Pantry Ingredients Page. As far as the keto bone broth is concerned, it’s long been touted as a health tonic and for good reason. Many bone broths are made with lots of root vegetables included though, and that can add quite a lot of carbs. 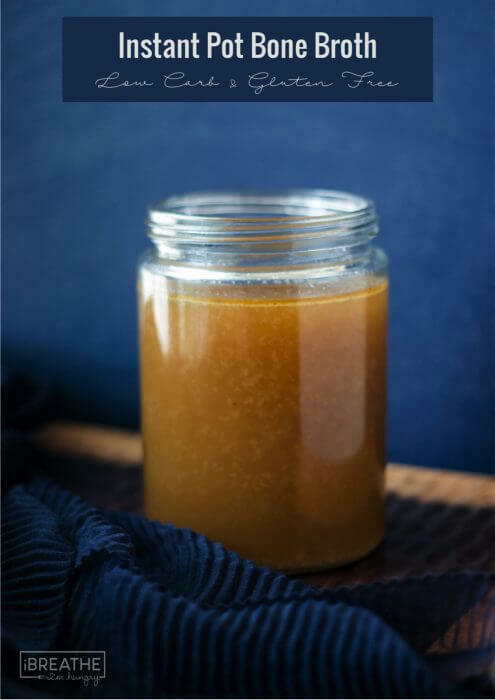 This low carb bone broth recipe has plenty of rich flavor, but a lot less carbohydrates – making it a perfect addition to your keto diet. 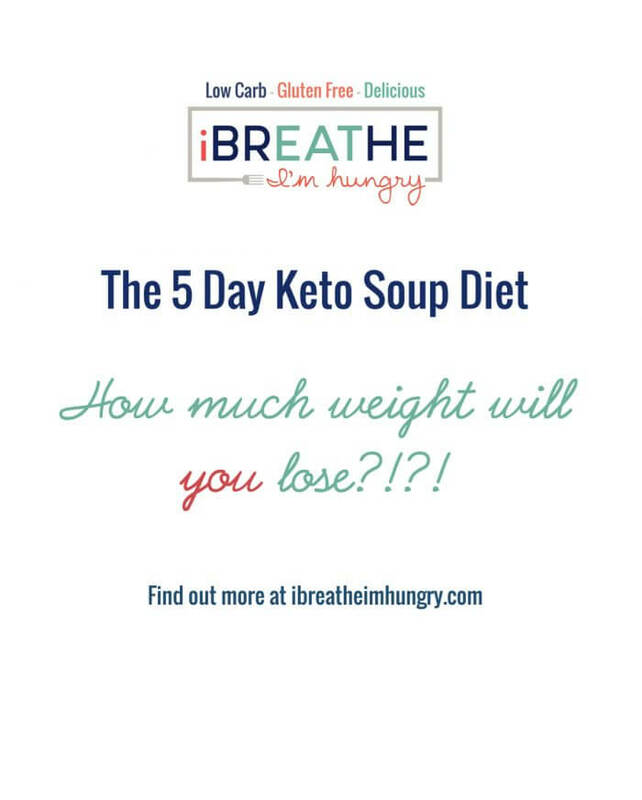 Many people on keto will drink chicken broth made from dehydrated cubes just to get enough sodium in their diets, and it’s effective for that purpose. 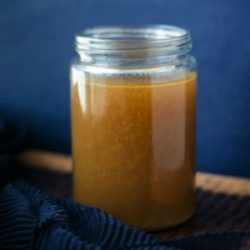 Homemade low carb bone broth is superior though, because it will give you not only the sodium you need, but also lots of other essential vitamins, minerals and electrolytes that support good health and a strong immune system. All of that for mere pennies per ounce and made in just about an hour? You can’t afford NOT to make homemade low carb bone broth part of your weekly regimen! This rich and delicious low carb bone broth can be made in your Instant Pot in just an hour! The perfect base for low carb soups, stews and sauces – or drink it like tea for a healthy boost! Combine all of the solid ingredients in a 6 quart Instant Pot. Pour in the filtered water up to the 4 liter mark. Seal according to manufacturer’s instructions. Turn pot on and set to Manual / High Pressure / 60 minutes. Once time is up, cool and release the pressure according to mfg. instructions. Strain the solids out into a clean pot or large container. Season the broth with sea salt as desired. Remove the solidified fat from the top of the broth and discard. Portion into containers and store for up to a week in the fridge, or freeze for up to 3 months. 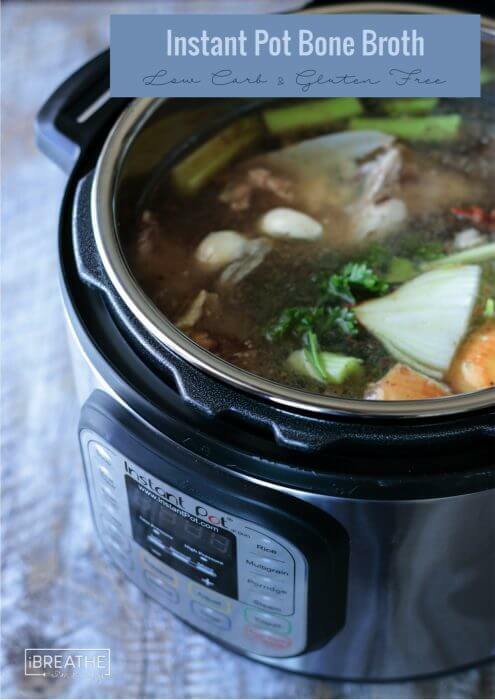 You can add all of the ingredients to your slow cooker and cook on high for 8 hours – not sure you’ll get exactly the same results with the bones getting soft, but you will extract enough from them to make a delicious and healthy broth! The nutrition information is approximate, but likely contains less carbs than stated here because I counted all the carbs from the veggie ingredients in the total, even though the solids get discarded at the end. 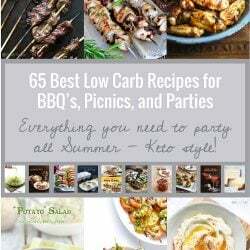 Looking for more great low carb Instant Pot recipes? 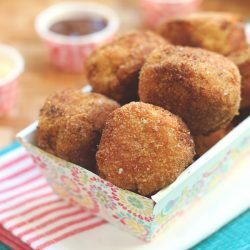 Try out these delicious fan favorites next! Jamaican Jerk Pork Roast, Easy Balsamic Beef Pot Roast, and Asian Ginger Orange Beef Pot Roast! This is such a great way to use all parts of a chicken and feel comfortable paying a little more for a quality chicken. Recipe looks great!! Wondering why they scrape off the fat?? 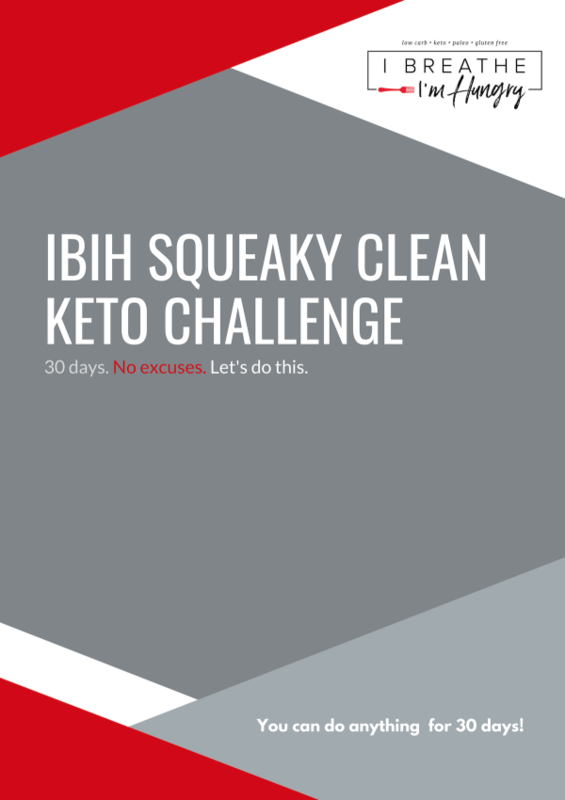 I used to do this prior to keto, but not any longer. Love this time saving way to make my Bone Broth. I will be able to make it more often now that it won’t take me a day and half to do it. be leached into the liquid.I cant find the answer anywhere. Thanks,for any help! yes it will absolutely contain carbs from those veggies as the sugars from the veggies will leach into your broth. 11. Portion into containers and store for up to a week in the fridge, or freeze for up to 3 months. Why do you use filtered water? I’m on well water, can I use that instead? What is the difference? Well water is fine Jane! Do we add apple cider vinegar when we add salt? I’m not seeing any mention of ACV in instructions. Thanks! I’m wondering the same! I’m planning to just add it with the water and solids today and see how it goes. Is there a specific reason for choosing the manual option on the Instant Pot, instead of the soup/broth button? I made beef bone broth today and after 2 hours the bones are still quite solid. I’m wondering if maybe the pressure is higher on “manual” than it is when you just press the soup/broth button? I did press it twice so the “more” light was on. Thank you for sharing this. I really hope I can make this once I get the time. I love drinking bone broth but just too busy making one. I’m now drinking Au Bon Broth and I like it so far. It’s delicious and tasty plus organic too. Now to see what all I’ve missed! How much salt do you add? Even just a ballpark… I’m notorious for putting in too much! Okay, would really like to know if there is a difference between and an instant pot and an electric pressure cooker? even if there is, could an electric pressure cooker be used instead? Can anyone tell me how long to leave it in there to get the desired results. The Instant Pot is just a brand-specific electric pressure cooker (yeah, and it does 7-in-1 work of a yogurt maker, slow cooker etc — but for this application it is just an electric pressure cooker). If you have a different brand pressure cooker, go ahead and run that puppy on high for 70-90 mins and see how it turns out. The nice thing is, like a slow cooker, you have a large window in which to cook. If you don’t get the results your want in the 70-90 mins, just stick it in for longer. You aren’t going to burn the broth. Why do you remove the fat from the broth afterward? 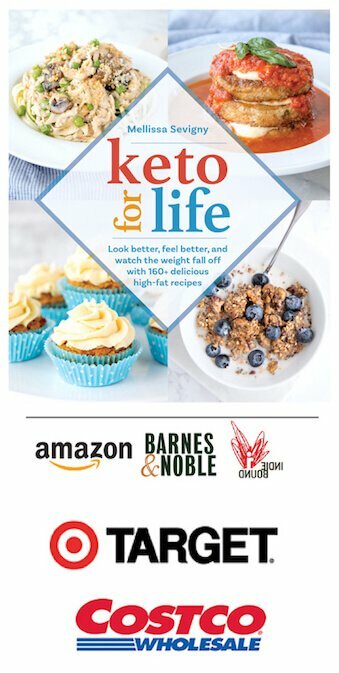 I thought that was an important part of bone broth and seems like a good thing to include for a keto diet? It’s a matter of preference Nicole! You can keep it in, but it makes it harder to drink unless you stir it often. It’s not that the fat is bad for you, just that in this application it can impact the enjoyability of the end product! Oh this is brilliant and I did not know that you could do this! I have an Instant pot, I even have a chicken! Many, many thanks. Because of your posts and recipes (which BTW are stellar) using the IP, I bought one in October 2016. I used it every day through the holiday season and now many times during every week. I also have all of your e-cookbooks and I love them. Have you considered doing an e-cookbook (or 2 volumes) exclusively for the IP? I would purchase in a heartbeat. BTW I am Celiac and have lost 106 lbs. 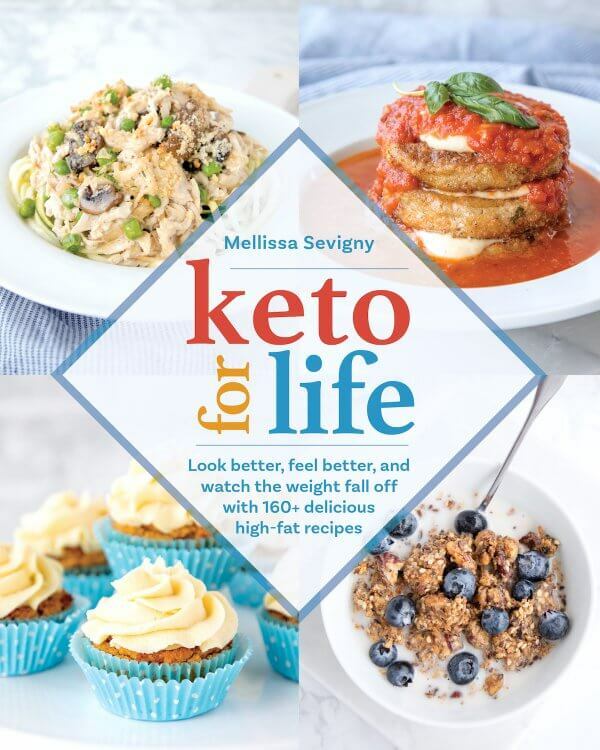 over the last 3 1/2 years, gotten rid of my type-2 diabetes, insulin resistance by doing Ketogenic low-carb and recently adding some Intermittent Fasting. Love your recipes and recommend your website to anyone who will stand still long enough to listen. Thank you for taking the time and keep up the great work. You are helping a lot of people. For some reason I thought bone broth was more difficult to make!! I’m going to have to try this out, thank you! How perfectly timely for me! I just got an IP a few weeks ago, and I’ve been saving bones in my freezer for just this very thing. 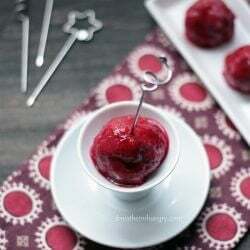 I haven’t made it yet but so far all of the recipes I’ve tried on this website have been great. 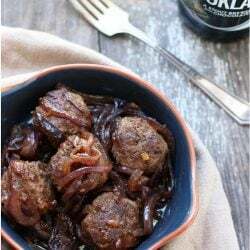 I have to add I made your Salisbury Steak recipe a couple of days ago. Holy cow that’s good stuff! And easy! that is definitely going into the regular rotation! Another rookie question here-why do we skim off the solidified fat before storing the broth? You don’t have to if you want to keep the fat, but it has no real flavor and can make the broth unpleasant to drink since the fat stays on top like an oil slick. But if you want to leave it in you certainly can! Ok, cool. I thought there might be a reason of which I was unaware. Thank you; this sounds awesome! Can’t wait to try it. Yes this will definitely work the same in a stove top pressure cooker Lisa! Having had a large one in the past, I can definitely say that I love the ease of the instant pot – but for canning and making huge pots of broth sometimes I do miss my giant stovetop pressure cooker! Here’s a tip I learned from someone on the instant pot group, use this colander inside and fill with the carcass. When it’s done just lift it out and all the broth is strained and cleaned. Works fabulously. Here’s a link to the one I use, you do have to pop the handles off, and it’s easy to do. I’ve used this so many times and it’s great! This is a great idea Shannon – thanks for sharing this tip! 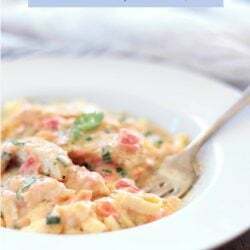 You will love the ease of the Instant Pot Aurora! I had mine for months before I finally tried it out and once I did I was kicking myself for not using it sooner! I’m excited for you! Do you include any celery leaves that are attached to the tops? Would this be drastically different if you wanted to do a beef bone broth? Perhaps needing to do this for a longer time since bigger bones than a chicken? It will work the same for beef bones Karen, but yes if you want them to really break down maybe add another 10 minutes! I don’t see the point of a cooked carcus where many essential nutrients have already cooked away including some collagen. I make homemade chicken stock (beef is too expensive) with chicken parts (back, wing tips, minister’s nose) and way more veggies. After simmering all day on the stove, not only does the house smell totally yummy, but everything is a mush. After straining and pressing solids through a sieve, the stock is refrigerated overnight. Fat is skimmed and saved in the fridge for other uses. The resulting stock is as solid as a bowl of Jello. No shortage of collagen and bones totally crumble into a heap. It definitely works just as well with parts Heidi! There are many methods to making a good bone broth, this is just my preferred way. @Heidi – The point is that many people just waste the carcass which is a shame. This way nothing is wasted and still makes for nutritious broth. Most of the collagen is in the bones and does not “cook away”. If the bones break easily and crumble to powder then you have extracted all you can. Unless you also want to eat the bone powder – which some people do. 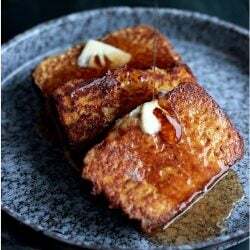 It can be dried and added to bread recipes. Yes you cook the chicken first, or use a rotisserie chicken even. I take all the meat off and set it aside for soup, chicken salads, or after we’ve eaten the chicken itself for dinner, then I use whatever is left (bones, skin, etc.) to make the bone broth! And it doesn’t even have to be one whole chicken – if you cook a batch of thighs, legs or breasts, you can use the bones from those instead. Thanks! Would love to try the beef as well! Haven’t broken my Insta Pot yet either – have some fear – but hopefully will get over it soon and try this soup! My bones need it for this ugly NY weather! That is such a good idea to use rotisserie chicken! yep, cooked whole chicken then de-chickened, lol. That’s what I call it, de-chickening. Another great thing is that we priced it out and one cannot purchase a raw whole bird for the same price you can purchase a whole cooked delicious one from Costco.YAY! I add two bay leaves and a tablespoon of peppercorns to this too (and I use carrots). It’s awesome and so great for improving nails, hair, skin and wound healing. I miss those Costco chickens!!!! I always got at least one when I’d do Costco runs in the states – you can’t beat the price and they tasted amazing! I will say that Belize chickens are delicious – but they are expensive and it’s nowhere near as convenient as getting them ready to eat at Costco! Could you freeze this to have later? Also about how long does it last in the refrigerator? Yes, I freeze it all the time. Wouldn’t keep it more than 5 days in the fridge but some would go as long as a week.